I did venture out yesterday when it was a balmy –31’c to get some pictures of my Mirror Mirror quilt. 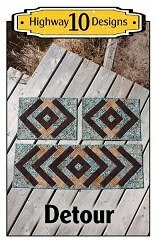 This is the same quilt pattern that I quilted for our guild a few weeks ago shown here. 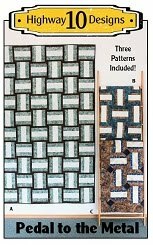 This is another great pattern for using up fat quarter bundles that seen to accumulate in your sewing room. I used an Island Batik bundle called Hydrangea. The panto is Taro, light blue So Fine thread and Dream Blend batting. 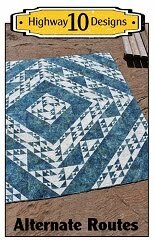 I had a great blue backing in my stash that worked well for this quilt and I am now stitching the binding on as I sit by my wood stove to keep warm! 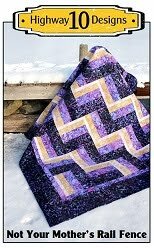 Love the colours in this quilt as well. Beautiful!! I live near Kingston Ont. We are getting freezing rain here. Planning on staying in for a couple of days. Kathy, I don't know how you do it being in such cold weather. Thanks for being brave enough to take those pictures. Love the batiks in that quilt. 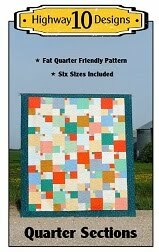 I have tons of fat quarter bundles; may need to think about using this pattern! Stay warm! What a beautiful quilt. Love the back. Stunning. Lived in Thompson Manitoba for 10 years so I know what you are talking about ,I do miss the crunch of the snow .Bundle up and keep warm .Love the quilt . With temperatures like that I'd never venture outdoors. I'm looking forward to the day that we move a little south and get out of the too-cold-for-me NY. The quilt is just beautiful and it looks refreshing against the white snow. That is crazy! It was in the low 60s here yesterday. Freakish warm weather. 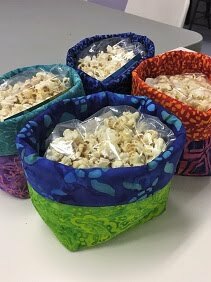 Love your backing fabric!